First of all, BCAA's or Branch Chain Amino Acids are THE MOST IMPORTANT Aminoacids your body needs, but cannot synthesize itself. They are the most important for keeping you anabolic (muscle building vs catabolic which is degenerative by nature). They are analogous to your Omega 3,6,9's ( I will not get into the fact that we do not need more 6's and 9's aren't actually considered essential) in that you body NEEDS them, they are the most beneficial and prudent, but we cannot manufacture them on our own. They are essential. Especially for muscle health. They are Leucine, Isoleucine and Valine, of prime importance is Leucine. They are muscle sparing, muscle armour and if you will, immune health for your muscles and protein synthesis (among other benefits). I am a big fan of BETA ALANINE. It increases intra-muscular Carnosine levels, Creatine and buffers Hyrdogen Ions. People are finally starting to realize that importance of INTRA workout supplements; not just pre and post. Yes you want to tear up your muscle fibers in order to break them up, and have them heal and thus become stronger (WHICH IS WHY RECOVERY IS KEY), but after all, it IS called Muscle Building; not Muscle Breakdown. You want to maximize your results, not burn out, recover faster and go that much harder and longer. There are many supplements that are popping up on the market; AminoCell by Nutrabolics , Intravol by Muscle Tech (also has Beta Alanine),Anjimoto's Amino Vital (which is a fantastic line) as well as numerous timed BCAA supplements (Allmax's Leutor is a prework out and I plan to devote an entire review to it- AMAZING! Warning, it will change your workouts). In my opinion, this one so far has surpassed my expectations and it is my #1 recommendation. Yes there are basics like Xtend , Recoup and various BCAA powders etc which are fantastic, but this trumps the competition as an INTRA WORKOUT Supplement. It isn't JUST the Beta Alanine (correct dose), BCAA's and electrolyte that make this suppelement stand out. I was so impressed by the fact sheet the company made, I thought I'd just give it to you as they present it. I obviously was not paid or repped to do this review..(although if they want to pay me or send me free stuff I am more than willing! lol). This product is something I put my name as a Nutrition and Supplement Consultant behind- increased strength, endurance, recovery and therefore gains! What is the point of investing your hard earned money on supplements that claim to be the latest and greatest phenomenon when they are NOT going to help you DURING your workouts? Bodybuilding is about Body - Building. During workouts, muscles are torn down and fatigue can be a tremendous challenge. By providing your muscles with effective nutrients DURING your workout, you will boost the anabolic response, fight the catabolic effects of exercise and delay muscular fatigue, ultimately leading to NEW muscle gains! Intra-workout supplementation has evolved, shouldn´t YOU? Gone are the days of simply drinking water, or one of those high sugar packed sports drinks intra-workout (DURING). If you are working out to gain muscle, Instead of carrying around something that simply hydrates you, or fills you with a bunch of simple sugars, which can actually be detrimental to the goals of a physique athlete. Why not fill your water bottle or shaker with peptides, amino-acids and electrolytes, that are actually going to help BUILD Muscle, increase recovery, decrease fatigue, in addition to staying hydrated? The next evolution in intra-workout supplementation has arrived! Try IntrAbolic today and SEE and FEEL the difference! 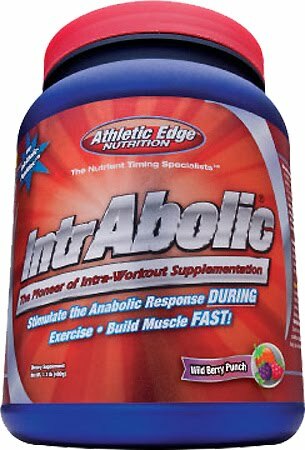 What makes IntrAbolic different from the current supplement that fit in the pre-workout and post-workout categories? By now, you are probably aware of the importance of two nutrient timing windows: pre-workout and post-workout. However, one largely overlooked nutrient timing window, is intra-workout(during-workout) supplementation. IntrAbolic is a new breed of muscle building supplements which was specifically designed from the ground up, to be taken intra-workout to maximize MUSCLE GROWTH! What makes taking nutrients Intra-Workout (DURING) so beneficial? Exercise in itself causes our body´s to increase blood flow to working muscles up to 500%, increasing amino acid delivery to skeletal muscle by 650%! At the same time, cellular sensitivity is increased, enabling our muscles to increase the rate of the absorption of substrates and fuel. When high concentrations of amino-acids are present in the blood stream DURING exercise, the anabolic response brought about by exercise is GREATLY increased! Furthermore, by taking IntrAbolic, you fight the catabolic (muscle breakdown) effects of exercise and delay muscle fatigue, resulting in new gains in muscle mass. Exercise + IntrAbolic= TRUE Muscle Building SYNERGY! What are the issues and needs that should to be taken into account and overcome when choosing an intra-workout supplement and how does IntrAbolic overcome them? Issue ONE: During exercise, physiologically, it is NOT optimal to be digesting intact protein, such as whey or food during your workout, which will divert blood and energy AWAY from your working muscles to your gut, exactly what you DON´T want. This is a primary reason why a regular intact protein like whey isolate, whey concentrate, milk protein or food should NOT be used intra-workout. IntrAbolic solution: We address these issues by utilizing a unique CUSTOM whey protein hydrolysate (WPH) exclusively found ONLY in IntrAbolic. Our custom WPH has undergone a high degree of hydrolysis, which breakdown large proteins into smaller fragments, called peptides. Our custom WPH supplies 70-80% of its peptides, in the shortest and most rapidly absorbed form, which are the low-molecular weight, di-and tripeptides, we refer to as IntrAbolic-Peptides. Our bodies contain transporters in our guts called PEPT1 which specifically transport di-and tripeptides. Due to the fact that di-and triptides do not have to undergo the same slow digestive process as regular protein, they can bypass the disadvantages that intact proteins possess. Buyer Beware: All hydrolyzed are NOT created equal. The benefits from hydrolyzed proteins come from the content of di-and tripeptides, with large variances in the percentage of hydrolysis the whey protein has undergone. It is the percentage of hydrolysis is low, the percentage of the beneficial di-and tripeptides will be low to nonexistent. A low degree of hydrolysis will leave you with a high amount of inferior polypeptides and little to NO di-and tripeptides. Check the panels of other products that contain hydrolyzed protein and look for the percentage of di-and tripeptides they contain. If they do not disclose the percentage of di-and tripeptides on the label, be warned they may be very low or even nonexistent. IntrAbolic contains an industry high of 70-80% di-and tripeptides, listed on our label. Issue TWO: Missing the intra-workout window of opportunity. Not only do slower absorbed intact proteins need to be digested, which is NOT desirable DURING exercise as mentioned above, but by the time the amino-acids start being released into the blood and get circulated to your muscles, the entire intra-workout window of opportunity is primarily missed. Additionally, the slower release of amino-acids into the blood from intact sources of proteins causes smaller blood plasma concentrations of amino-acids limiting the anabolic response. Issue THREE: Many products are incomplete and supply ONLY the branch chain amino-acids (BCAAs). Our bodies need ALL the nine EAAs to build muscle, not just the three BCAAs. That´s why they are called ESSENTIAL amino-acids, our bodies MUST get them from our diets and cannot make them. Don´t settle for products that are incomplete and do not contain all the EAAs needed to build muscle mass. Issue FOUR: Low amounts or unlisted amounts of the most anabolic amino-acid leucine. Research has shown, taking leucine in the amounts of 3-5grams per sitting, directly stimulates protein synthesis, as well being anticatabolic. IntrAbolic solution: IntrAbolic contains leucine in our custom hydrolyzed whey and in addition, an extra 2.5grams of leucine in free form, putting it right in the efficacious muscle building range. Issue FIVE: No focus on increasing strength and endurance. IntrAbolic solution: Including 1.6grams of beta-alanine. This amino acid is being touted as the next creatine. It works by increasing intracellular carnosine levels which has been proven to soak up hydrogen ions (the molecule that cases the burn). This allows you to train harder and longer ultimately leading to increased muscle mass and strength. Issue SIX: Does not contain electrolytes that are important intra-workout as they have the ability to assist in absorption of fluid uptake in the gut, assist in hydration and supply energy to working muscles. The Minerals calcium and magnesium are suggested as they are needed for muscle contraction. IntrAbolic works by utilizing a unique whey protein hydrolysate (WPH) found exclusively in IntrAbolic. Our custom WPH has undergone a high degree of hydrolysis (over 30%) which supplies 70-80% low-molecular weight, di-and tripeptides we refer to as IntrAbolic-Peptides. Unlike standard intact proteins and long chain peptides, IntrAbolic-Peptides do not have to undergo the typical slow digestive process. Their unique properties also allow them to utilize a highly efficient transport system, specific to di-and tripeptides. Unlike regular amino acids derived from intact proteins which are slow to enter the bloodstream, IntrAbolic-Peptides are rapidly absorbed, causing a tremendous spike in extracellular amino acids. Research has shown, it is extracellular amino acid concentrations that stimulate and signal our bodies to increase protein synthesis and maximize the anabolic response. Concurrently, this large amino acid spike causes an insulin increase to fight muscle breakdown which occurs during training. Rapid and efficient absorption also makes these peptides ideal for use during your workout as they will not cause bloating or stomach discomfort like other intact proteins. Another highly efficient and rapid way to get amino acids into the blood (second only to WPH) is through ingestion of free-form amino acids (ffAA´s). Intensive nutrient timing research studies show ffAA´s (due to their quick absorption) can cause a big spike in blood plasma amino acid concentrations and when timed properly with exercise, may illicit a much greater anabolic response from exercise than intact proteins can. Combining WPH with ffAA´s creates a powerful one-two punch in boosting anabolism and fighting catabolism. The beauty of combining di-and tripeptides from WHP with ffAA´s is both use different intestinal transporters to carry them into the blood, maximizing absorption speed with very little redundancy. Current research shows that di- and tripeptides may actually enhance the ffAA´s transporters, further increasing the rate of absorption. This powerhouse amino acid has been shown in research to both directly stimulate protein synthesis and indirectly by increasing the hormone insulin, which is both anabolic and anti-catabolic. Simply put, this is one of the most effective amino acids you can take intra-workout and further enhances the anabolic response when other essential amino acids are present. Touted as the biggest scientific breakthrough since creatine, the amino acid beta-alanine has exploded into the sports nutrition industry, as more people find out just how effective this supplement really is. This worldwide explosion can largely be credited to the enormous popularity of our formula, IntraXCell, The World´s First DEDICATED carnosine booster. When taken at a minimum dose of 3.2g per day, its cumulative effects when taken daily for 1-2 weeks, can impact your workout performance greatly. Much of beta-alanine´s effects are realized by boosting the synthesis of a intracellular (inside the cell) buffer called carnosine. Carnosine is a dipeptide, composed of the amino acids, beta-alanine and histidine and has the ability to stabilize muscular pH by soaking up fatigue causing hydrogen ions (H+). IntrAbolic has been dosed perfectly to stack with IntraXCell to maximize the speed of carnosine synthesis and bring about BIG GAINS in strength, muscle and endurance.. FAST! The importance of replacing the electrolytes: sodium, potassium and chloride should not be overlooked since, during exercise, we are losing electrolytes at an accelerated rate. Just as important, is their ability to assist in the absorption of fluid and carbohydrate uptake in the gut. The minerals calcium and magnesium are included as they are needed for muscular contraction and muscular growth. When magnesium levels are low during exercise, research has shown fatigue increases. No. NOT ALL whey protein hydrolysates (WPH) are created equal as there are large variances in degrees of hydrolysis the whey protein has undergone. A low degree of hydrolysis will leave you with a high amount of inferior polypeptides and little to NO di-and tripeptides. Check the panels of other WPH products and look for the percentage of hydrolysis the whey has undergone. If they do not disclose the degree of hydrolysis on the label be warned as it may be VERY low. Do not mistake the percentage of how much of the product is WPH for the percentage of hydrolysis the whey has undergone. They are NOT related. For example, IntrAbolic protein is 100% WPH, but the degree of hydrolysis is over 30%. Individuals participating in weight training looking to make BIG gains in muscle mass and boost recovery between training sessions. Any individual involved in athletic activities where maintaining and building muscle mass, strength & endurance are needed. Q: Do I need to add anything extra to IntrAbolic during my workout to make it more effective? NO, NOTHING else is necessary. No extra branch chain amino acids, no extra essential amino acids, no extra beta-alanine is needed. All ingredients in IntrAbolic are concentrated, research supported doses and satisfy 100% of the nutrient requirements during your workout in one groundbreaking formula. Q: Can I take IntrAbolic late at night? Great review! You should do private consultaitions. Thank you for the lovely comment on my blog. I wish you well also. You must be a quite serious weight-lifter for all those powders! Impressive. BEST BREAKFAST PROTEIN FIBER BOWL EVER!